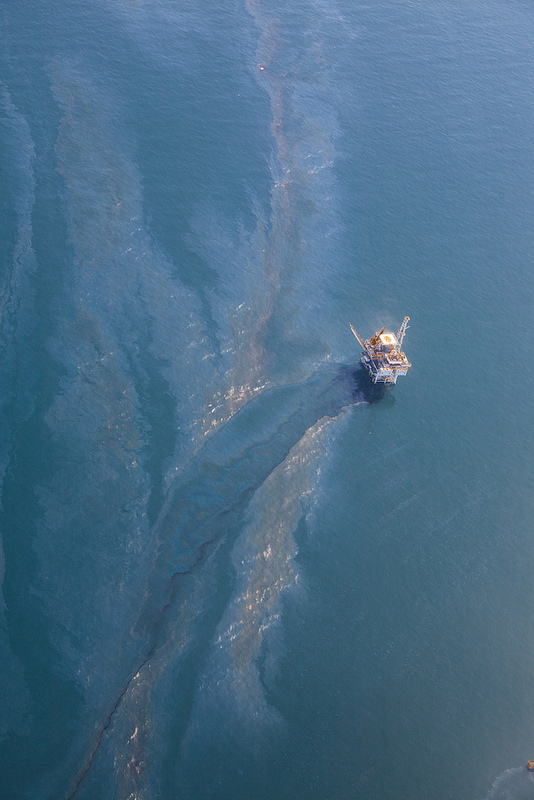 Oil from the Coal Oil Seep Field drifts across Platform Holly, off the shore of UC Santa Barbara. Oil in the water is one of the strange graces of life on Califonia’s South Coast. What we see here is a long slick of oil in the Pacific, drifting across Platform Holly, which taps into the Elwood Oil Field, which is of a piece with the Coal Oil Point Seep Field, all a stone’s throw off Coal Oil Point, better known as UC Santa Barbara. The Coal Oil Point seep field offshore from Santa Barbara, California isa petroleum seep area of about three square kilometres, adjacent to the Ellwood Oil Field, and releases about 40 tons of methane per day and about 19 tons of reactive organic gas (ethane, propane, butane and higher hydrocarbons), about twice the hydrocarbon air pollution released by all the cars and trucks in Santa Barbara County in 1990.The liquid petroleum produces a slick that is many kilometres long and when degraded by evaporationand weathering, produces tar balls which wash up on the beaches for miles around. This seep also releases on the order of 100 to 150 barrels (16 to 24 m3) of liquid petroleum per day. The field produces about 9 cubic meters of natural gas per barrel of petroleum. Leakage from the natural seeps near Platform Holly, the production platform for the South Ellwood Offshore oilfield, has decreased substantially, probably from the decrease in reservoir pressure due to the oil and gas produced at the platform. On the day I shot this (February 10), from a plane departing from Santa Barbara for Los Angeles, the quantity of oil in the water looked unusually high to me. But I suppose it varies from day to day. National Geographic says that using the tar had the effect of shrinking the size of Chumash heads over many generations. There are also few rocks hard enough to craft into a knife or an ax anywhere near Santa Barbara, or even in the Santa Ynez mountains behind it. All the local rocks are of relatively soft sedimentary kinds. Stones used for tools were mostly obtained by trade with tribes from other regions. Here’s the whole album of oil seep shots.